It was son no 2's birthday on Saturday. As a family (me and the babies) we never got into the gift giving or making a very big deal about celebrating anything, post divorce. I would bake a cake, their favourite chocolate cake and I would cook them their favourite meal or we went out. I did try to organise something for Saturday but Big Sis was working, so that cut the numbers for a dinner and son wasnt that keen either. Son was working in the afternoon anyway. I still had a couple more of those lovely cooking chocolate bars so after running around on my usual Saturday errands and battle with the supermarket hordes, I made chocolate brownies. The Gluten Free Chocolate Brownies have just been voted as THE birthday baked treat I have to make for every birthday. I didnt take any pictures, we dived into the baked goodies immediately so here is a picture off David's website. 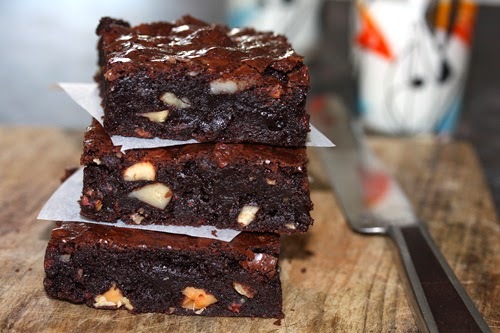 Its the absolutely best brownie i have had!